NXP LPC4088 is completely compatible with LPC1788, you can use LPC4088 instead of LPC1788 without changes. The LPC4088 is a Cortex-M4 microcontroller for embedded applications featuring a high level of integration and low power consumption at frequencies of 120 MHz. Features include 512 kB of flash memory, 96 kB of data memory, Ethernet, USB 2.0 Host/OTG/Device , 8-channel DMA controller, 5 UARTs, 2 CAN channels, 3 SSP/SPI, 3 I2C, I2S, 8-channel 12-bit ADC, 10-bit DAC, QEI, LCD controller, SD/MMC interface, motor control PWM, 4 general purpose timers, 6-output general purpose PWM, ultra-low power Real-Time Clock with separate battery supply, and up to 165 general purpose I/O pins. The HY-LPC4088-CORE Board features an LPC4088 controller, JTAG, an USB Device, onboard power supply and all the input output pins taken out via a 2.00mm standard Berg Connectivity. 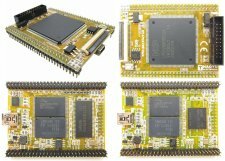 HY-LPC4088-CORE Board can be used as a general controller board for various designs and different connectivity options. The HY-LPC4088-CORE Board has a 20 pin Wiggler-compatible JTAG interface which can be used for debugging/programming.